← I Have No Time To President!!!!! I’m Sciency Fairing Right Now!!!! How Global Warming Looks On Your Thermometer!!!!! I’ve done this before, and, I’ll probably do it again. The graph above depicts how global warming would look if you were to check your thermometer, …. assuming it was the global temperature. It would look red because that’s how most alcohol thermometers look, rather than the silver looking mercury thermometer. I used Fahrenheit because I’m an American, and that’s the way we roll. Typically, our out-door temperature thermometers go from a max of about 120 degrees to a minimum of about –40, so, that’s what I used for the vertical axis. I had in mind to do the same for the strange Celsius people, but, as I was making the graph it occurred to me that I had no idea what the min and max is of their typical thermometers!! Apparently, beer isn’t always good for everything! Who knew?!?!?!?! This was a bit fun and a bit maddening. …….. strike that, incredibly maddening and funny all at the same time. A friend of ours had seen the first post I did like this, and he asked me for the spreadsheet and method. I told him that I had no idea where that sheet was, or if I had even kept it. It could be somewhere on one of three computers, two of which I can make run again. But, I told him it was a fairly straightforward process and that I’d be happy to reproduce it for him. Five/ten minutes …. what’s the big deal, right? Well, here’s the source for the data, it’s NASA’s GISS. The problem was, the page was down!!!! I couldn’t access the data!!!!! I told him I’d have it to him before the end of the night. Now, mind you, I’ve been forcing myself into a good mood for a while because of personal things …. like I forgot I had to bach it tonight. Don’t get me wrong, I don’t mind it from time to time, but, who the hell is going to fix me supper at this time of night? Well, I better have another beer and think on it for a bit ….. I digress. So GISS is down. I tried, ….. sipped some beer, tried again, sipped some more beer. It’s strange but regardless of the amount of beer I drank, the page was still not available!!! I thought this would be a teachable moment for all the henpecked fellows out there. You can tell your wives, regardless of the amount of beer you drink, things will still be screwed up!!! I’m assuming this wasn’t because some NASA web guy didn’t just get drunk and screwed things up, but, that’s probably not you, anyway, so you can still use that. …… Hmm, it seems I have to digress, again. Where was I? Oh, yeh, I can’t get to the data so I can’t accommodate, which wouldn’t be a big deal, except I said I would. Damned NASA!!!! They used to be able to send people to the moon and now they can’t keep a web page up!!! So, I sipped on some more beer and read about president Zero being pissy with reporters trying to ask questions. Better have some more beer on that one …. it’s weird, but, it wasn’t even St. Paulies (sic?) which made me realize that GISS being down was NBD!!!! There’s always our friend Paul Clark and WFT!!! He’s always got the GISS data!! Cool!!! I can oblige!!! ….. Except …. Paul formats it in a bit different manner. Don’t get me wrong, I prefer the way he does it, it’s just that it makes it a bit more, this way, rather than the way GISS does it. You see, Paul uses monthly averages only, not annual, Now, this wouldn’t be a big deal …. easy as pie!!! Except, that darned beer!!! At one point in my life, I used to use Excel as part of a way to make a living …. mostly to port spreadsheet date into a usable and meaningful database. Well, that’s not what I do, anymore, and I never did like that homely sister of a database, anyway. How does I Excel? ……..
Take the link of the WFT to Excel, or any other spread app. You gotta separate the text to columns. For the Fahrenheit, you have to multiply by 1.8. GISS says the average temp is suppose to be 14 deg C, or 57.2 deg F. For Fahrenheit, just add the 57.2 to the converted column. This gets us the monthly temp in Fahrenheit, but, we need to make it a yearly temp. So, “average” twelve months and complete it for every month …. (in Excel, just double click on the lower right corner of the cell you did this in and it will auto-fill the rest of the column). Now we have to get the “yearly” average, that is to say, January through December. Copy and special paste (values only) to anther sheet. Add a column next to the Year/decimal year .. should be column “A”. Highlight column A. Click on “data” which is now in the ribbon above, and then “text to columns” and separate by the period sign. Then sort by column B. Hide all else other than the “92” …. And then graph the values. On the vertical axis go to the negative desired, if desired, and then tell it to fill to the bottom value. Click on the bar graphs and format the data series to what color and separation you desire. Done. Now, now ………now the GISS page is available and half that crap, the crap I had to think about, isn’t necessary any longer!!!! Funny stuff! Anyway, thanks Lat!!!! I have no doubt in my mind you caused this!!!! But, it’s cool that you did! Thanks man! 51 Responses to How Global Warming Looks On Your Thermometer!!!!! Actually that’s a very intuitive way of communicating Climate Change to the masses. Only shortfall: The projection according to the IPCC’s models to the year 2100. I think James is trying to work out how many more 6 packs that’ll take. He has a spreadsheet of barrels of ale to the excel plot somewhere. running once. Music to my ears! Sclo, (hic), the thermoinmeters Airn’t thhee onnly thhings filled withh aalc’holl but (hic!) ssspr,eadsheeets tooo! This website is a self-funded personal project by Paul Clark, a British software developer and practically-oriented environmentalist and conservationist. Most normal people would expect a person to develop a site in a system they use. Perhaps YMV? I would expect WFT to use the SI system of units (which we were taught in school 50 years ago) which it does. Then I fail to see your humor. Perhaps you are trying to mock those dumb Colonials who have not converted to a different arbitrary measurement system? If so, blame yourself. We dropped the pound as well. Ah, so you were merely making fun of the dumb old Colonials again. Should have known your statement was shallow. No, merely pointing out that one would expect a scientific website to use a scientific system of measurements, and it does. Then it would not be “funny” as you declared. Your words betray you. You clearly have no sense of humour. I have a great sense of humor. But I also know when something is not funny. You should learn the difference. I would think the “scientific” unit of choice for temperature is the Kelvin, and climate scientists like to use anomalies, which are neither Kelvin nor Celsius (yet they are usually in Celsius units). Not all scientists use SI units all the time either. Many physicists use the cgs-system (centimeters-grams-seconds) or more properly the Gaussian-cgs system. The SI system is often referred to as the MKS-system (meters-kilograms-seconds). The two systems are not exactly the same as the arbitrary constant in Coulomb’s law is different. So conversion between the systems is more involved than just multiplying by powers of ten. As for weight, many misuse SI units when they measure their weight. Weight is the force of gravity, and the proper unit is the Newton. However, when you measure your weight in kilograms–you’re using a mass unit. At least pound-force IS a force unit. Please refer me to a peer reviewed scientific paper that uses degrees Fahrenheit, thank you. Heh. Admittedly, it’s getting harder and harder to find such papers. There is a lot of old data that uses Fahrenheit, and any paper referencing such data should mention the required conversion–or imply it. For example here’s a paper that mentions Fahrenheit himself (http://www.ncdc.noaa.gov/oa/climate/research/Peterson-Vose-1997.pdf) and tip-toes around the required conversion. Here’s another (http://researchnews.osu.edu/archive/TBA–LTonly.pdf), but it may not meet your peer-review requirement. I’ve seen others, usually involving steam and US power plants, but I’m not going to waste my time looking for them. I do have a relatively recent Mark’s handbook (9th edition) that still uses Fahrenheit in some of their tables. I don’t know if the current edition (11th edition?) uses Fahrenheit. I actually prefer metric, and our US system is really metric. The US inch is defined as exactly 2.54 centimeters. The US standards changed to metric references many years ago. Yet I’m not afraid of using Fahrenheit–I know how to convert. So do I. I have forgotten Reaumur though. Did they rename Ray Bradbury’s book, “Celsius 232.78,” so you metric folks would understand it? No, but it was still a great film. Here’s an AGW paper from just last year that uses Fahrenheit. One problem I’ve seen with many newer graduate students is that they lack the ability to handle units. I attribute this in part to working with the SI system for all their undergrad work and being handled trivial problems where no knowledge of units is needed. Thank you for that. I am surprised. Nice graph, thank you for the work you put into making it. No problem….. that stuff is fun for me. For Celsius, -40 to 50 would work. Minus 40 works because both the F scale and the C scale intersect there. 50 works for the high as that’s half-way to pure water’s sea level pressure boiling point. 40C is just a high fever :P, 50 would cook eggs, slowly. The reason the old system of measurement is still sometimes seen and used in America is because of that old obsolete concept called ‘freedom’. In countries like Canada our government rammed the metric system through in the seventies at a huge cost and in a heavy-handed manner(fines for lack of compliance). Incidentally my American made car and garden tractor are completely metric bolted. The warming trend over that timescale is 0.8 degrees. For actual perspective, the difference between the present and an ice age is about 4-5 degrees. You’ve selected a temperature range of 160 degrees. That’s why the trend is harder to see in your silly chart. The trend is hard to see because the actual warming is imperceptible. The 160 degrees is what an actual thermometer’s range is. That’s what we call an “actual perspective”. As towards the temperature readings during one of our ice ages …… well, I’ll take an actual thermometer reading over some hypothesis, any day, for an “actual” perspective. But, thanks Al! You’re now approved for commenting without moderation. Welcome. I don’t really see how I can simplify the point I’m making here, it’s not even a question of science, just common sense. The trend over that time period is 0.8 degrees, so of course you can’t see it well using a scale of 160 degrees chosen ‘because that’s the range of a thermometer’. It’s nonsensical. A tiny change to global average temperature represents an enormous amount of energy. Think about how much energy is required to raise the temperature of a planet 1 degree. Albert, also, the temperature in the Earth’s crust is NOT millions of degrees, while we’re talking about temperatures. That’s why the trend is harder to see in your silly chart…. Does the planet you’re on have an atmosphere? Your chart inspired a web page that has the option of showing a number of different temperature records in that form. It also demonstrates how NASA/GISS temperature records have been altered since 1999. I’d like to add NCDC global or USA datasets for earlier years, but have yet to find any. Verde, that’s outstanding! Nice work! And, thanks, that’s quite a compliment! For the CONUS data, I think the best way would be to simply click on each month at the NCDC site, and then compile it yourself. Sorry about the wait in moderation, I took the weekend off. Let us know if you get the NCDC stuff to work! Compliments much appreciated, James. Thanks for taking a look. Thanks also for the suggestion regarding NCDC data, but I’m seeking past data that was saved at time of publication. I believe NCDC past data is regularly altered, just like the GISS alterations that ‘Steve Goddard’ has documented. Will advise of significant updates.
. . . but I’m seeking past data that was saved at time of publication. 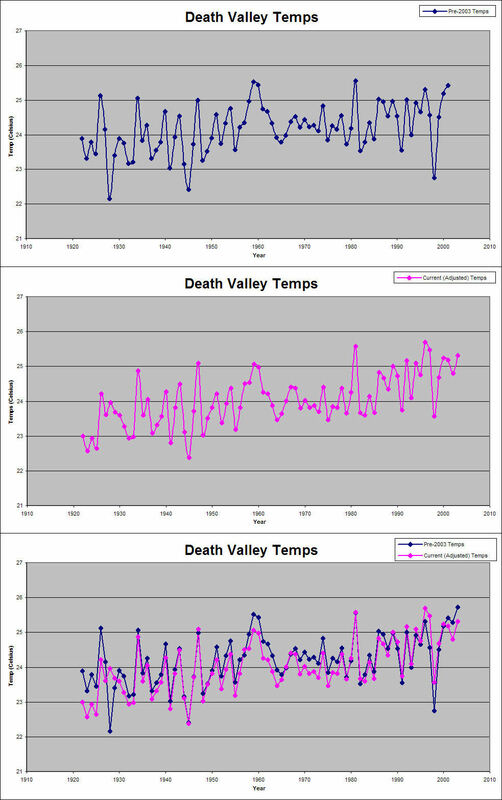 I saved the original data back when John Daly (http://www.john-daly.com/) was alive and talking about Death Valley. I haven’t checked their most recent values, but I doubt it could be any better. I believe that http://www.john-daly.com/ is one of two locations where I found the GISS 1999-raw dataset for CONUS. Nothing there for NCDC global and CONUS. The individual Coop station daily listings I used are claimed to be raw data, but “raw” is a bit misleading. Most of it has been taken from written reports, and errors happen. Not only that, the only really useable form in which it’s offered has been converted from °F to tenths °C. For an extreme example of how bad “raw” can be, look at Workman Creek, Arizona, extreme high/low. There are lows of -147°F and highs up to 1,473°F. Many thanks for that. Perhaps for the anomalies, you could restrict the y-axis to the range +2 to -2 degrees C (+4 to -4 degrees F) in order to show the variation more clearly. The range of anomalies is relatively wide because the page was really intended more for comparing local stations (at this point, mostly in Arizona), which have a much wider range of temperatures (look at Barrow, AK, for example). The graph is drawn on pixel boundaries, which limits grid line spacing to numbers divisible by 5 and 9. I may later adjust spacing to fit higher-resolution displays. Well, yes, and no. 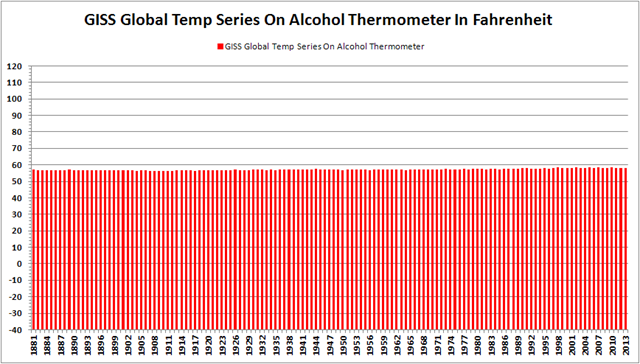 This is what NASA’s GISS says is the “average temperature of the Earth”. The way NASA goes about it is farcical so …. But, yes, this is what the warmists believe to be the average temperature of the earth’s surface. ….. sorry about the wait in moderation. You’re now approved for freely commenting. Pingback: Graph vs. Graph = Political Journalism | Watts Up With That?